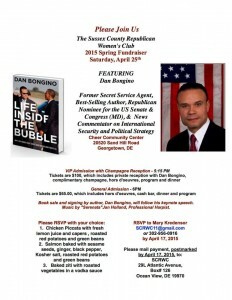 On Saturday, April 25th, The Sussex County Republican Women’s Club will be holding their Spring Fundraiser, featuring guest speaker Don Bongino. Mr. Bongino is a former Secret Service agent and best-selling author. Tickets to the event start at $65, which gets you hors d’oeuvre, cash bar, dinner and the program starting at 6 pm. For just another $35 you get access to the VIP Reception, which includes all the above, along with a private meet and greet with Mr. Bongino and complimentary champagne, the VIP Reception begins at 5:15 pm. Just click on the flier above to enlarge for details on how to reserve your place. 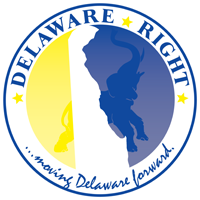 Please help support one of the most influential Republican clubs in Delaware, this event will be well worth the minimal cost of admission. One Comment on "Sussex County Republican Women’s Club"
For a ticket I will go to this, hobnob, and report back here.